Hi folks! Thanks for stopping by today. 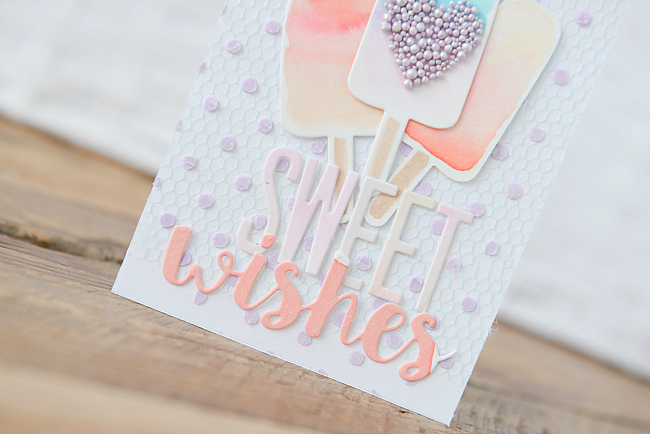 I'm sharing a fun card today that is full of fun techniques I'd like to share with you. First up, the background on this card is a technique I've wanted to try for some time. I wanted to see if using a stencil + textured embossing paste would hold a fine mesh in place. And it does! 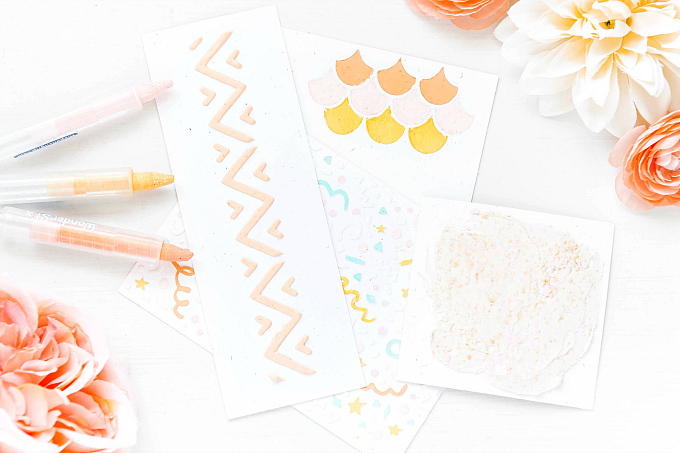 I really love using this polka dot Tim Holtz stencil, but I find it's a bit plain on white cardstock alone, so this technique gives it a bit more texture, and I love it! 1. I like to pre-cut my mesh to the card size so that I don't have to wiggle it all later. It is a delicate hold, and this could damage it. 2. I lay the cardstock/mesh combo down on a craft mat, and tape the stencil overtop so that I am not having to tape the mesh and accidentally pull it off when disassembling. 3. Once I have applied the texture paste (I used a colored paste here, for a tutorial check out this post), I leave it to dry a bit. This is a balancing act though, as you do not want to let it dry completely, just enough so that the dots will hold the mesh in place. It's a really fun technique and could be done with all types of detailed tulle! Next up, I wanted to share a quick tip for anyone who has dies without the accompanying stamp sets. I love dies. But sometimes I don't purchase the matching stamps. Sometimes the stamp is just not versatile enough for my liking and I don't like buying sets that I only need 1 or 2 stamps from. So I go ahead and buy the dies and watercolor instead! This works with all types of dies, and it's a fun way to give new life to your dies. 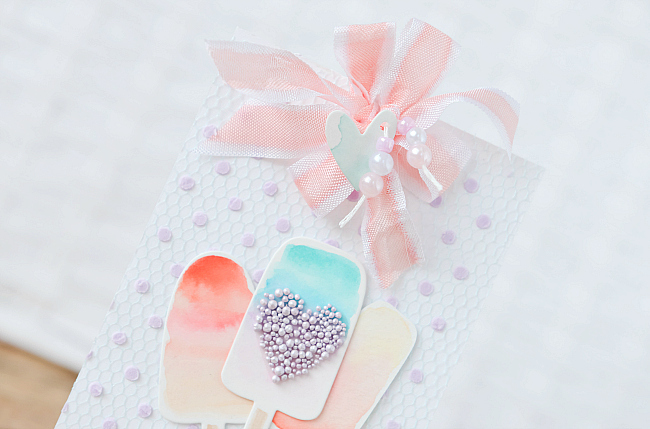 I've also been experimenting with various texture mediums and I looove these little beads. I can't remember what they're called (ETA I found a link to them here! ), but they stick really well to a strong adhesive and look much cleaner than tiny glass beads (due to the different sizes that fill in shapes nicely). To make these little guys stick, I love using Scor Tape - especially a size that is wide enough to run through with a shaped die. My go-to size is the 5 inch, because it allows me to cover entire cards if I like or to simply cut out shapes. To cut the shape, I use parchment paper or another type of stick-resistant paper. I cover the sticky side and run it through the Big Shot just like any other paper. Then I peel the product backing, add it to my project and peel off the parchment paper when I'm ready to add the beads. So easy! Can't wait to try this with other mediums. 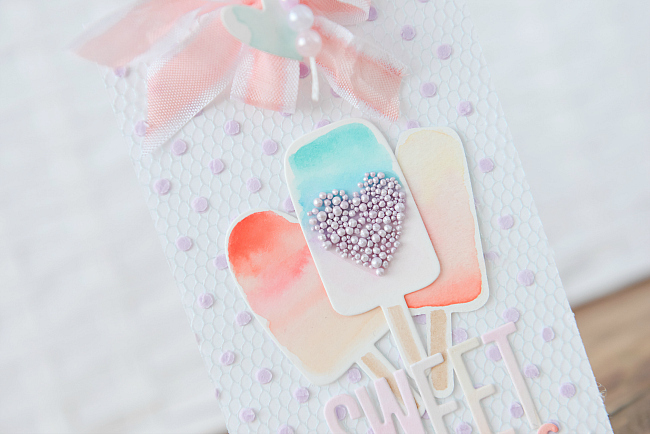 Lastly, this card also features some of my watercolor striped ribbon, which you can find a full tutorial on right here. 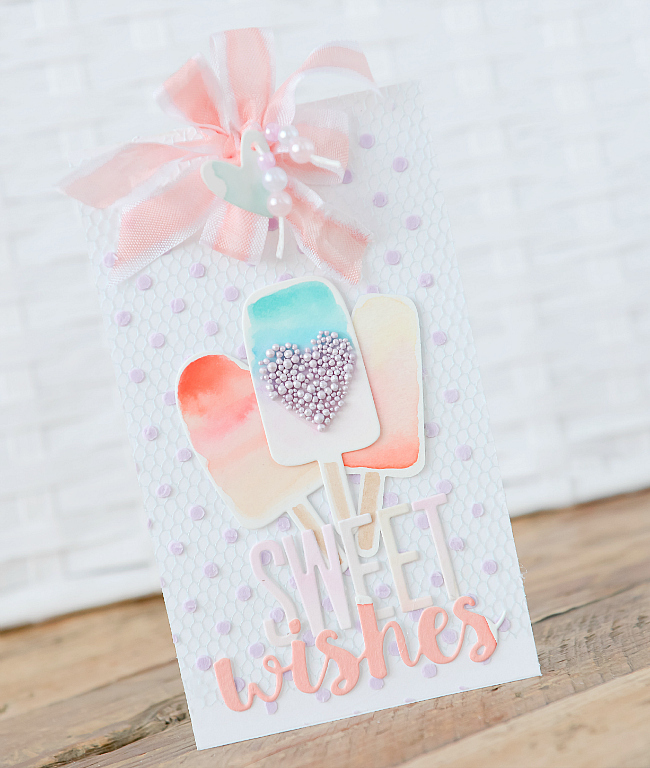 Other supplies used on this card; Papertrey Ink Summer Sweetness die for the popsicles, Papertrey Ink Headline Alphabet die, My Favorite Things Dienamics Cause for Celebration dies, PTI Tiny Tags die, and Zig Clean Color Real Brush Markers. I love the way texture brings a card alive, and I love even more that despite all this texture, this is still a perfectly mail-able card! This is darling and so perfect for summer! The addition of the little beads is a delightful accent!